Greetings and welcome to Facebook Fridays! for April 4, 2014. Looking for love, luck, money or success? 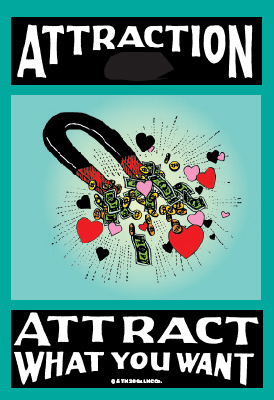 Then Attraction is just what the root doctor ordered. Today's give-away will have four lucky winners who will receive our very popular Attraction products. The grand prize is an Attraction Spell Kit which the recipient may use to draw their heart's desire, success in life's endeavours, or increased wealth! Our runner-up will be sent an Attraction Mojo Hand to dress and carry on their person to act as a magnet for fortune or love. The third place winner will recieve a fixed and dressed Attraction Vigil Candle to burn as a beacon to bring romance, fame, or riches. 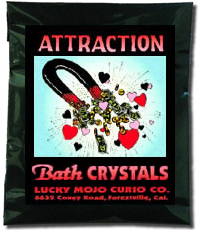 And, our consolation prize is a package of Attraction Bath Crystals to add to the bath or laundry to gain a magnetic advantage. All you have to do to enter is to go to the Lucky Mojo Facebook page, scroll down, and post a comment to the Facebook Fridays! status message for April 4, 2014. First thing tomorrow morning, we will select four winners at random, announce their names here, contact them via Facebook to get their mailing addresses, and send them their FREE Attraction products. We have a winner! In fact, we have four lucky winners! Our Facebook Fridays Giveaway winners for April 5, 2014 are: Brian Sina, Persephone Hesperous, Johnny Angel, and Susurro Spiritus..